Introduced in March 1983, the Bronica GS-1 in 6×7 cm format was the largest SLR produced by the company and the first medium format camera with TTL flash metering. It is a completely modular camera, with several optional focusing prisms and viewfinders (with and without exposure metering), lenses, and film backs. Tamron ended production of GS-1 cameras and lenses in June 2002, with sales continuing until stocks were depleted. In developing the 6×7 camera (GS stands for "Grand Shooting"), Bronica paid particular attention to implementing a LED display, using a Seiko #0 electronic shutter with digital control, an upgraded PG-series of lenses to overcome the small aperture of the #0 shutter, TTL-flash, multi-format backs and rejecting the use of a revolving back to reduce size and weight, and make it a mobile camera. During the design phase a #1 shutter with a larger 30mm aperture was considered. However, Bronica found that the helicoid diametre would have become 100mm or more, countering the purpose of a (relatively) small and light weight system, and in addition the shutter speed would be limited to 1/400 (not 1/500 as with #0 shutters). The choice of a #0 shutter was then made even if it restricted the possibility of large aperture lenses, especially of longer focal lengths. In practice the design of the GS-1 made it possible to differentiate the GS-1 from its main competitors, the heavy Mamiya RZ and Mamiya RB 6x7-cameras with rotating backs and Seiko #1 shutters. Designing the new PG-lenses for the small shutter aperture, Bronica emphasized correction of aberrations, reducing vignetting and a unified color balance for the whole series, with particular attention paid to distortion, aberrations, field curvature and chromatic aberration for the wide angle lenses. The GS-1 body is wider than the SQ-A, due to the larger film format, however the depth and height are about the same. The body, back base and mount are made of a die cast light alloy. The mount is stainless steel, while the front, left and right body covers are made of reinforced plastic. The body weighs 630g. About 22 500 camera bodies were made in total, with a first series (serial 310XXXX) of about 1500 units, and a internally revised series of about 21 000 (serial 311XXXX, 312XXXX and 313XXXX). The last 12 000 or so had small updates to the finish (black buttons). One camera (serial 3118000) has been noted with a brown leather finish (similar to certain other Bronica special editions), and a 80mm F3.5 lens (serial 8400001) with a white lens cover. This was possibly a one off for promotional use when the 80mm F3.5 lens was launched in 1996. Shashin Kōgyō (Photographic Industries), Vol 41, No. 9 (1983) p82. Image presumably originally by Bronica. A lens- or leaf-shutter camera, the GS-1 will synchronize flash at all available shutter speeds. Lenses are designated 'PG', with available focal lengths of 50, 65, 80, 100, 110, 150, 200, 250, 500 mm, and two teleconverters (1.4× and 2×). At the introduction of the camera, only the 50, 65, 100, 150, 200 and 250mm lenses were available, with a 110mm, 350mm (never released) and 500mm being announced. 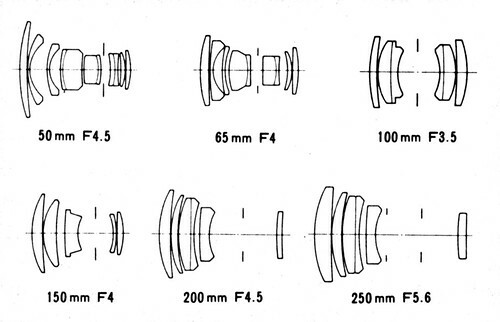 The 110mm and 200mm lenses were later presented together with the teleconverters at the 1984 Photokina. The 500mm lens was only made by special order. The 80mm was the last of the GS-1 lenses, introduced in 1997, and is difficult to find. The 150mm lens is a long-focus design (not a telephoto like the 200mm and 250mm), and is supposed to give especially beautiful background blur and a natural and soft image wide open. All lenses have electronic Seiko #0 shutters, which communicate with the body. The shutter dial and digitized control circuit is on the body. 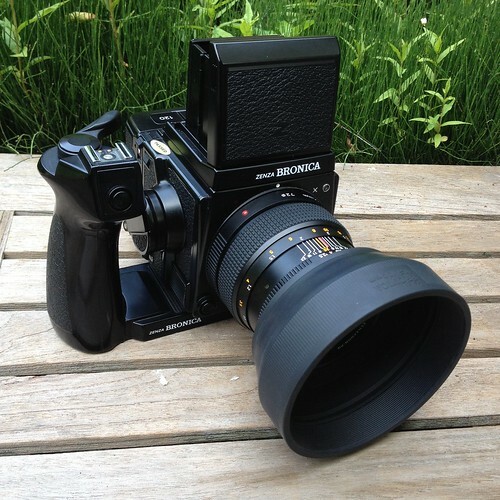 The lenses have comparable or better close focusing distances than Hasselblad or Pentax 6x7 lenses, but less than bellows focusing cameras, such as the Mamiya RZ67. Extension tubes of 18mm and 36mm are available for specialized close focus photography, and the 110mm macro with 36mm extension tube goes to 1:1. While the lens flange is different from the SQ-mount, the focal flange distance of 85mm is the same. Fotodiox makes adapters for mounting PG-lenses on Mamiya M645, Pentax 645, Nikon F, Canon EF, Pentax K and Sony Alpha mounts. The GS-1 had a waist level, prism, AE-prism and rotary AE-prism viewfinders. The field of view ratio for all viewfinders is 94%. The waist level finder has a 4.3X magnification. The basic prism finder was based on the ETR-finder, and has a magnification of 0.87X with the 100mm lens at infinity and a 1.5 diopter. It weighs 425 g. The standard AE-finder also has a magnification of 0.87X, and weighs 460 g and has a metering range of EV 2-17 (ISO 100). Using an AE-finder in aperture priority mode allows the camera system to set the shutter using 1/8 steps, though the selected speed is rounded to 1/2 steps in the display, while the manual shutter speed dial only has full steps. By default the camera came with a plain matte focusing screen. It is easy to use the camera both in vertical and horizontal orientation with one of the eye level finders. However, it is difficult to shoot vertical pictures with the waist level finder. Bronica had the same design challenge with waist level horizontal shots for the ETR, and used the same patented (No. 950970) solution for the GS-1, a rotary prism viewfinder, with both average and spot metering. With the appropriate back, the camera will shoot a wide range of film sizes, including 6×4.5, 6×6, 6×7 cm, and Polaroid. The 6x4.5, 6×6 and 6×7 cm formats could be obtained in either 120 or 220 roll length. Unlike some other Bronicas the GS-1 never had backs for 35mm film, even though 24x69mm and 24x36mm backs were announced with the system. The 6x7 back is landscape and the 645 back is vertical unless the camera is rotated. The GS-1 was also available with a dedicated G-1 speedlight flash and manually operated speed grip which allowed TTL-flash metering together with the AE-prism. This made the GS-1 the first medium format camera with TTL flash capability at its introduction i 1983, before the Hasselblad 500 ELX and Rolleiflex 6006 came to market in 1984. It was also the only 6x7 camera with TTL flash until the introduction of the Pentax 67II in 1998. It is not possible to get TTL flash using the Sunpak MX-2D TTL module designed for older Minolta cameras, or Metz SCA 386 TTL module for Minolta, even thought some sources speculated that this was possible (you will only get the flash ready light in the finder, though no TTL).. The G-1 flash shares some components with, and may have been produced by National/Panasonic. The Bronica SQ-Ai and ETRSi support TTL-flash through the Metz SCA 386 TTL-module, but this instead uses a dedicated 6-pin TTL connector on the camera body, as with the Mamiya 645 Pro TL and Hasselblad 503-series. ↑ 1.0 1.1 1.2 1.3 1.4 1.5 1.6 1.7 1.8 1.9 Shashin Kōgyō (Photographic Industries) Vol. 41, No. 9 (1983) pp 77-83. GS-1 information from the medfmt.8k.com website (archived copy from the Internet Archive, from March 2011; mostly an archive of even older bulletin board-based discussion, with a few pictures). This page was last edited on 6 April 2019, at 15:17.